But . . . as you wrestle with your Major Work, do you crave less anxiety, more confidence, better work flow, even real answers to all those knotty quandaries? Meditation and mindfulness can help. In my academic coaching practice, I’ve found, to my surprise, that many graduate students in their dissertations and professors in their articles use spiritual methods to help them through the Purgatory of academic writing. And I encourage them, primarily in two ways—meditation and mindfulness. If you don’t like the term meditation, call it My quiet time or Resting without snoring. Whatever you call it, I encourage you to consider it. Why? Today regular features on the Internet, popular articles in online publications, cover stories in print magazines, and many scientific publications are full of reasons backed by studies that attest the benefits of meditation. They’re physiological, psychological, emotional, social, and spiritual (for example, Denning, 2018; Melnick, 2013; Seppala, 2013). In the 1970s, meditation was sanitized for the West by the courageous Harvard MD Herbert Benson (1975) with his groundbreaking book The Relaxation Response. He documented empirically with laboratory techniques that meditation can lower blood pressure and the tendency to hardening of the arteries and stroke (Mitchell, 2013). Benson virtually started mind/body medicine. In 1988, he founded the Mind/Body Medical Institute of Harvard Medical School and in 2006 the Benson-Henry Institute for Mind Body Medicine at Massachusetts General Hospital (Emory, 2011). His original book has been republished, with many subsequent variations, and a host of other relevant publications, both scholarly and popular, are now available. Meditation is widely accepted and even prescribed by enlightened physicians and other healthcare professionals (Mayo Clinic, 2014; National Center for Complementary and Alternative Medicine, 2013). The practice doesn’t need to connect to any religious movement or set of dogmatic statements. Nor does meditation have to be mysterious. You can do it at home, in the library, at the faculty meeting, the bus stop, and even in a chapel. Books, articles, blogs, and videos on meditation continue to proliferate. For an introduction to both meditation and mindfulness, see two excellent books: Meditation for Dummies (Bodian, 2012) and Mindfulness for Dummies (Alidina, 2014). Mindfulness is meditation’s fraternal twin, and sometimes they are used interchangeably. Mindfulness too has received ever-increasing attention over the past decade (e.g., Bertin, 2013; Time Magazine’s 2016 special issue “Mindfulness”). Numerous definitions and distinctions have appeared to distinguish between the two, and without becoming embroiled in the (scholarly) minutiae of the differences, I like Annie Daly’s (2014) simple explanation of the basic difference. Meditation involves a conscious choice to repeat certain words, phrases, or sentences. Mindfulness means simply becoming acutely aware of what you are experiencing right at this moment. Dr. Mark Bertin (2013) explains the permutations with reference to Jon Kabat-Zinn, who created the first mindfulness program in the 1970s, based on concepts of Buddhism. Kabat-Zinn founded the Stress Reduction Clinic and Center for Mindfulness in Medicine, Health Care, and Society at the University of Massachusetts. With ample credit to Kabat-Zinn, Bertin asks us, finally, to bypass all definitional convolutions and simply practice. Both meditation and mindfulness require practice and a few instructions. Here is what I do. Away from everything, I sit in a quiet place (my tech appendages out of thumbs’ reach). I close my eyes and take a few deep breaths. Then silently I say a word, phrase, or sentence that means something to me (“Peace,” “Ah,” “All is in order,” “Chocolate”). Or I repeat a positive statement, an affirmation (“I now have all the answers for the Discussion section.”). I just keep repeating my chosen words. One of the most recommended stints is for thirty minutes, but I can never last that long. At about four minutes, my to-do lists rear up. So I start with two, five, or ten minutes. I set a timer, and if I peek at it before it bongs, no one will know. A warning as you practice: If thoughts come in, and we all are plagued by them, you may find yourself veering off into last night’s junk-television plot, your sweetie’s sudden text-messaging silence, the tuna spoiling in the fridge, or a thousand other things. As soon as you catch any of these thoughts, don’t condemn yourself as a failed meditator. Just come back to your chosen words and keep repeating them. Gradually (very), those intruders will quiet down and may even cease for long periods. Be patient with yourself. There’s no right or wrong way to meditate, and twenty minutes is no holier than two. The important thing is to keep at it. Mindfulness is not for multitasking but monotasking. I use mindfulness when I am especially anxious about the ever-proliferating impossible-to-do list or an impending client deadline. I focus on the thing I’m doing, pushing aside all those other things knocking at the edges of my mind. Sometimes I focus on my breath—in, out, in, out. I turn my attention to the physical sensations of, say, typing, and the subtle satisfactions of my fingers tapping, the muted clacks a percussive music. I feel my chair and its support of my back. I see the words appearing on the screen and sense my power to add, delete, change them. I feel my mind thinking about what I’ve just typed or want to type. I am in the moment, being mindful. Eventually, your experience may be like mine. Your mind will grow sharper, and you will feel rested. You will be more aware and appreciative of your surroundings. You’ll feel more powerful and on top of things. Even answers you’ve chased will start coming (I’m talking to you, Review of the Literature). You’ll likely feel an unaccustomed calm and peace. You’ll know what to do next in your dissertation chapter or article section. Or you’ll feel a lifting that is suspiciously like joy and not just a caffeine rush. You may even look forward to your next meditation/mindfulness session. You say you have no time? Too busy? Too stressed? You tried it and it didn’t work? Too much like New Age (perceived) hooey? Corporate training consultant Karen Exkorn (2014) nails these five big excuses for not practicing meditation or mindfulness and suggests how to overcome them. “No time” means you haven’t made the time. Even three minutes works (your timer again). “Too busy” means you don’t have to add special time for the practice. Use mindfulness doing what you’re doing, only more consciously (dishes, diapering, grading papers). “Too stressed”? Focus on doing one thing with full consciousness. Exkorn uses eating Hershey Kisses. You can use anything—a banana, driving, listening to a student pleading for an extension. “Tried it”? For how long? Give it a fair chance, like any new habit. 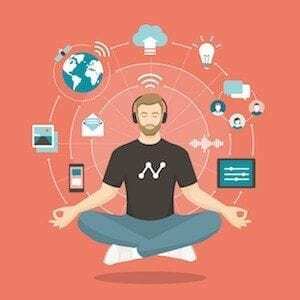 Granted, the popularity of mindfulness has turned it into a lucrative business, with all kinds of apps, courses, magazines, websites, videos, and t-shirts. See Gelles’ (2016) New York Times article “The Hidden Price of Mindfulness Inc.” But, as Gelles says, you don’t need any of the paraphernalia. “It’s not enough to buy into mindfulness. You have to practice it, too” (para. 22). And you really don’t need any of the stuff. Just do it. Once you get in the habit, you’ll see that meditation and mindfulness are your friends. You’ll appreciate their benefits, look forward to your next session, and may even become addicted. At the least, for a few minutes you’ll stop battling that blinkin’ cursor. Alidina, S. (2014). Mindfulness for dummies (2nd ed.). Hoboken, NJ: John Wiley. Benson, H. (1975). The relaxation response. New York, NY: HarperCollins. Bodian, S. (2012). Meditation for dummies (3rd ed.). Hoboken, NJ: John Wiley. Time Magazine (2016, September 2). Mindfulness: The new science of health and happiness. Special issue.